How did you first learn about post-graduate service? From a friend who served at a maternity home after college. What other options were available to you, and why did you decide on Maggie’s Place?I had been not making long term commitments so that I could be free to discern and visit possible religious communities, but when I realized that it wasn’t the right time for all of that for me, I looked in to doing something else. I was not attracted to working a job just for me, but wanted to use my time for others, so that’s why I decided on service. Tell us about your service experience: I served as a full-time, live-in volunteer at Maggie’s Place, called a MissionCorps member, for two years. 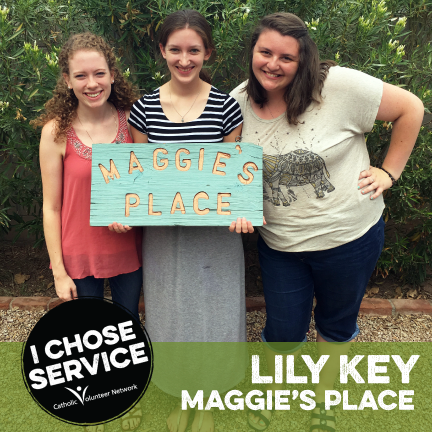 The unique thing about serving at Maggie’s Place is that we live in the homes we run with the women we serve, so you get a lot of intimate contact with those you serve and are able to get to know them on a personal and human level. The actual work was very down to earth: helping the moms by holding babies, cooking, cleaning, being present, answering the phone, receiving donations, etc., but because it was all in a living environment, it stretched me more than anything I had ever done before. Being selfless and living the works of mercy was my job, and it was all the time! It has been the greatest privilege and the greatest challenge. What benefits have you gained from this experience that you might not have received otherwise? I have grown immensely due to my service experience. It was certainly the most challenging position I have ever had, with many responsibilities and a lot of independence and self-direction. I grew in my knowledge of people, how they change, how to give and receive difficult feedback, the need for open and non-defensive or judgmental communication. I grew in professionalism, the ability to not take things personally, and in healthy boundaries. I learned a lot about myself! Community life brought out my strengths and weaknesses for all to see, and so became an opportunity for greater self-awareness and also humility as I have to admit my own weaknesses or be exhausted by the pressure of hiding them. Spiritually, I have come to realize that all happens only by God’s Divine Providence, and He is attentive even to our smallest needs. He will provide! I could not have done any of what I did on my own strengths or skills, but only by the gifts and graces God gave me to do it. Lastly, through living with the moms at Maggie’s Place, I have learned so much about poverty and people experiencing challenges that were previously unknown to me, and it has changed by whole outlook on the world. What advice do you have for someone considering post-graduate service? Post-graduate service is an excellent preparation for whatever comes next. I would say that I learned more in my two years (even my first year) of service than I did in four years of college about people, about myself, and many of the soft skills that are the difference between average and excellent candidates for any job. The service I did was particularly intense, living and serving in community, but any service will stretch you, making your more self-aware, more generous, and more willing to grow and be stretched in future experiences, whatever they may be. It will change the direction of your life and your outlook on the world though, so if you’re comfy where you are, be forewarned!